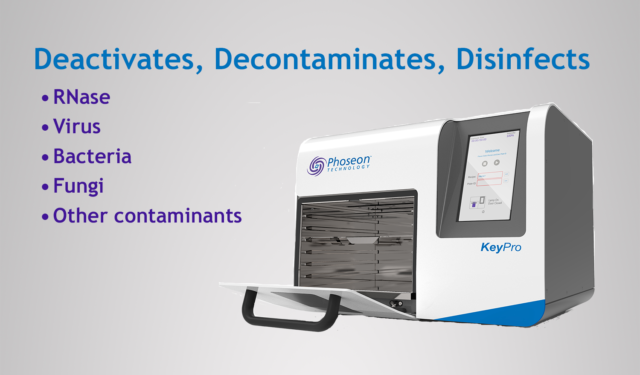 Phoseon’s KeyPro™ KP100 UV LED decontamination system ideally suits labs that need to quickly and reliably inactivate viruses, or labs that require high fidelity RNA library prep, sequencing, and PCR, Complete inactivation of laboratory contaminants can be accomplished by the KeyPro UV LED decontamination system in just minutes and at fraction of the cost of traditional methods. Phoseon’s patented Semiconductor Light Matrix (SLM™) technology encapsulates LED arrays, optics, and thermal cooling technology to maximize disinfection and/or decontamination performance and increase lab productivity. Potential biological contaminants are pervasive and invisible in the laboratory. Miniscule amounts of common enzymes such as RNase can make an experimental series inaccurate. Standard techniques for decontaminating laboratory equipment can take hours. KeyPro™ UV LED decontamination system eliminates contamination without residue or rinsing, saving up to 90% of the time and cost of chemical decontamination. Simply load compatible reagents and solvents and run your decontamination cycle just prior to adding sample. Potential biological contaminants are pervasive and invisible in the laboratory. Miniscule amounts of common enzymes such as RNase can make an experimental series inaccurate. Standard techniques for decontaminating laboratory equipment can take hours. KeyPro™ technology eliminates contamination without residue or rinsing, saving up to 90% of the time and cost of chemical decontamination. Simply load compatible reagents and solvents and run your decontamination cycle just prior to adding sample.